Artichokes, one of my all favorite vegetables, are immature thistles with a mid section that is completely inedible. I didn’t know this the first time I dug into one of these babies and no one at the table was about to tell me. Leave it at this: there is a reason for the “choke” part of this vegetable’s name, since the top section of the very best meaty part of the plant has a fibrous, spiny section that definitely should not be ingested. I learned the hard way. Eating them is an experience: pulling off the leaves, one by one, and scraping off the soft undersides with your teeth. Once you’ve de-leafed the thing, you get to the heart of the plant, where you have one great hunk of veggie. Dip it in clarified butter with a little lemon or some homemade aioli and you have a heavenly treat. 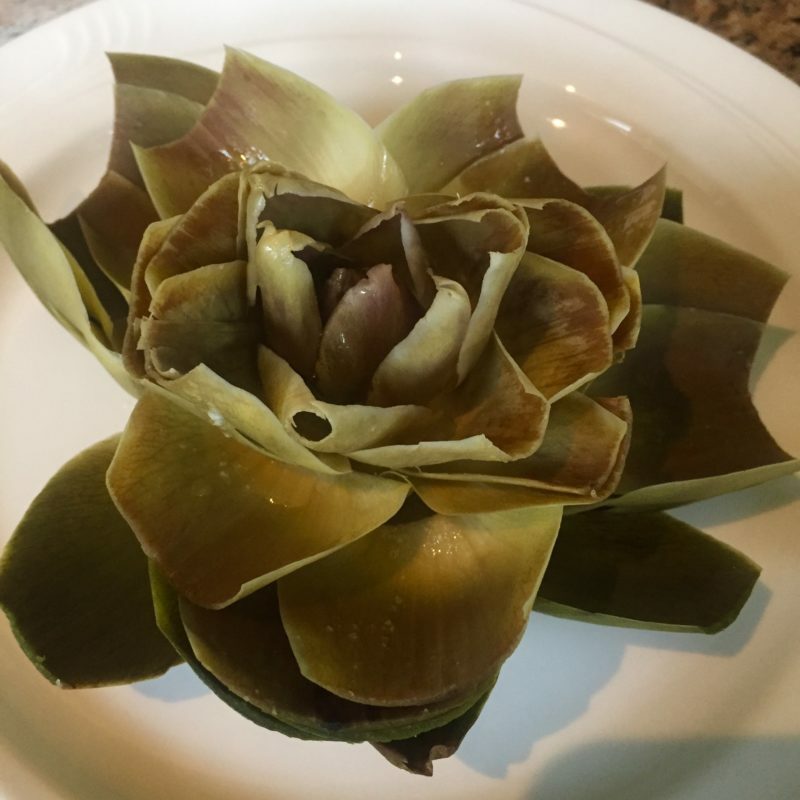 Artichokes have powerful health benefits for brain and body: They are the fourth highest antioxidant-rich food and the most phytonutrient-dense of all vegetables. They are also an excellent source of vitamin K, a key nutrient in brain health which acts as a vasodilator, expanding blood vessels to let more oxygen and nutrients reach the brain. Lay the artichoke on its side and cut about an inch or so off the top of the plant to create a nice level top edge. Cut the stem off the bottom. Be careful when you handle these. There are little thorns at the end of each leaf. Some people take the time to snip them off. I just handle carefully. Fill a sauce pan with about an inch of water. Turn the artichoke upside down in the pan, resting on the cut edge. Bring the water to boil. Cover, turn heat to low and steam for about 15 minutes or until a knife inserted in the center of the stem penetrates easily with no resistance. 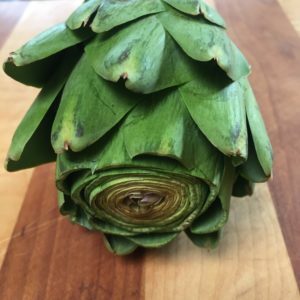 Remove the artichoke and gently spread the leaves apart exposing the center choke, a fibrous section on the top of the heart of the plant. Gently scrap off the choke with a spoon, exposing the heart. Pull off the leaves one by one, dip in butter or aioli, scrape of the tiny meaty part at the base with your teeth. When all the leaves are pulled off, you’ve made it to the heart of the plant. This is what you were waiting for. As long as you’ve gotten all the hairy part off, this is totally edible. Enjoy!